Wagner’s operates two greenhouse production ranges. The original site in Minneapolis includes 4.5 acres of production space. Our second site, about 30 miles northeast in Hugo, includes an additional 3.5 acres for plugs and finished plants. Our careful production techniques begin with the moment seeds and cuttings enter our facility. Every seed lot undergoes germination testing in our greenhouses. Every package of seed or bag of cuttings is tracked back to the parent lot and tracked to each tray in which it is sowed or stuck into. 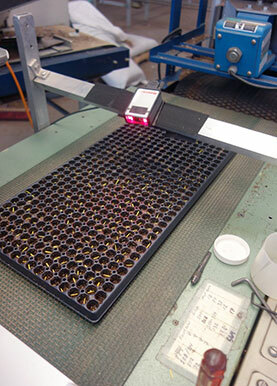 Seeds are sown and cuttings are stuck into barcoded trays and scanned into our computer system. Seeded plug trays are then loaded onto Dutch tables, which are mechanically stacked and readied for germination. All seeded plug trays then enter one of 12 germination chambers. 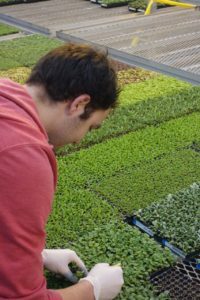 The plug trays remain in the germination chambers for one to twenty-one days, depending on the crop, after which they are moved out into the greenhouse. Click here to watch us on Grow with Kare. Click here to watch a time lapse video of our Poinsettias. 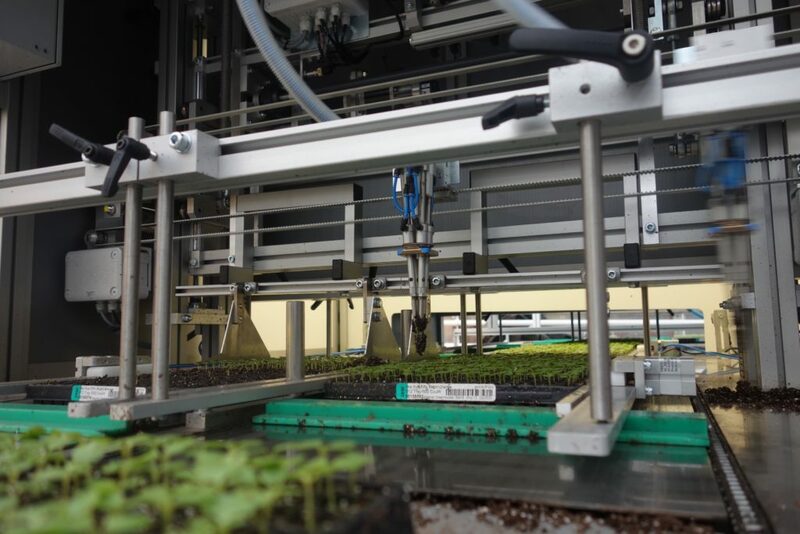 The Dutch tables facilitate our growing technique, which involves moving the plug and liner trays as a table unit through different environments to achieve optimum growth and development. 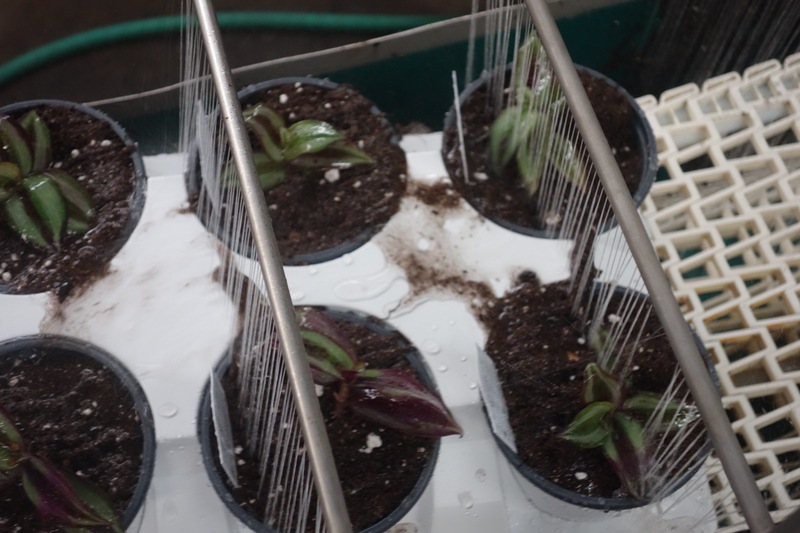 As trays move through the greenhouse, different tools are used to control the environment and affect plant growth. 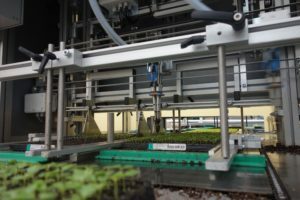 All greenhouse compartments are controlled by a Priva computer system. The compartments are heated with hot water heat and cooled with a fan/pad system. HID lamps provide proper photoperiod and supplemental lighting to the entire range. Energy curtains reduce light intensity and heat loss. Watering booms are used throughout the greenhouse. Before plug and liner trays are ready to ship, our quality control department patches each tray to 100% fill. 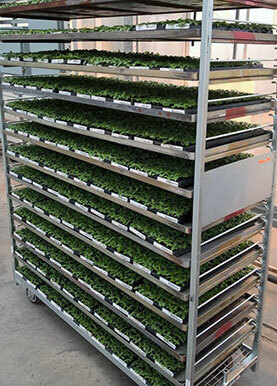 As plants mature, the trays are moved into the shipping area and staged by tray size and variety. A trolley system facilitates order picking, and a packing line streamlines shipping. Our close proximity to the Minneapolis-St. Paul International Airport ensures that shipments are on their way to their final destination within hours of being packed. For our garden centers, as well as local retailers, landscapers, fundraising groups, we continue along the growing process. Plugs and liners are transplanted into packs, pots, and hanging baskets to keep growing until they are filled out and flowering. When they’re ready, the plants are ready to ship to one of our garden centers or to a local retailer, landscaper or fundraising group.